We’ve all come to a place where we looked at our dashboard and found that the gas light had come on. This can be a result of procrastination and laziness or we just hadn’t been paying attention. These little lights come on at the best times too, like when you’re running late for work or have to hurry to a clothing store to find an outfit an hour before the event starts. How about we see just how long we can push it to the limit. Depending on the make of your car, there’s a certain amount of miles you can go on E before you MUST find the nearest gas station. 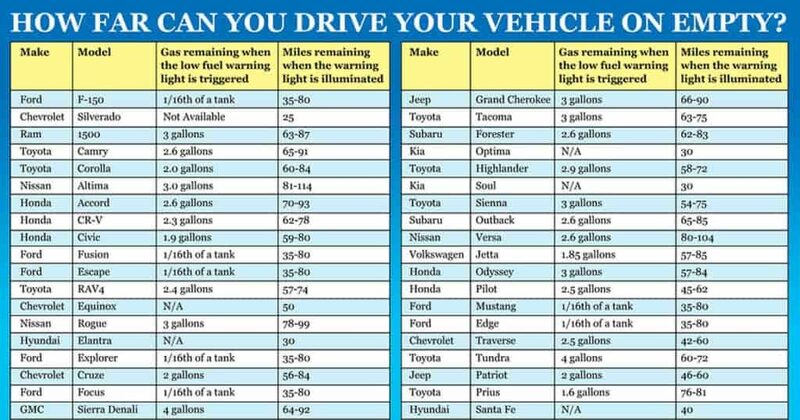 Here’s a nifty chart that shows both the amount of gas that’s in your tank and the amount of miles you can go on it when your light comes on. Now that you know you’re not completely running on vapors, you can rest assured that you can get gas after work or right after you’ve picked up your new outfit. But wait! There’s a catch. Okay, I know we’ve just given you peace of mind, but you know there’s always a catch. Although you have some leeway, there are still dangers to running on empty for too long. When you’re running on low fuel, you’re pulling up sediment from the bottom of the tank. This is especially harmful to older vehicles because it runs the risk of a clogged fuel filter. A clogged fuel filter makes it harder to run the car because there isn’t enough fuel making it to the engine. So yes, you have SOME wiggle room but not much because you don’t want to harm your means of transportation. Plus, I’m sure you don’t want to buy another vehicle before you’re ready to. Keep an eye on your gas gauge. Best practice is to fuel up when you get to about a quarter of a tank. Your car and your pockets will be very grateful to you.